Each year you can get some amazing Superdrug deals on beauty products and fragrances etc when Black Friday sales fall upon us. Normally Superdrug launches its BF UK offers a little early, but what ever day the official ad goes live on its website we will be on top of things so you do not miss out. When it comes to health and beauty Superdrug is one of the leading retailers who caters for customers who shops for perfume, health, skin, beauty products and much more. You will also find many Black Friday discounts on electrical items such as toothbrushes, dryers, clippers hair removal. There are now over 850 stores in the UK and is now the second largest for supplying such products behind Boots. If you spot any leaked Superdrug Black Friday ad deals for this year, please do list them below. Take full advantage of the Black friday Sale online at official website because they are now live. BLACK FRIDAY SALE AT SUPERDRUG IS LIVE – If you’re a member of superdrug you can now take full advantage of the Black friday Sale. Yeah its website says online and in store will start early with amazing member only deals. Superdrug has confirmed they will be returning on Friday 23rd November, but I have heard they could possibly be starting a few days earlier this year, i am not too sure. The Superdrug Black Friday Sale will be returning official on November 24th. Whilst you wait for the BF sale to kick in i found this Unicorn Sweet Magic Lip Balm reduced from £2.49 down to just £1.99. You can also buy 1 and get the 2nd for half price on selected lip balms. The next Superdrug Black Friday Sale Event will begin on 24th November 2017. This has been confirmed on the official Superdrug website. The Oral B Genius 9000 Black Electric Toothbrush price has been cut down to £99.98 from £280. Just visit Superdrug online and you will see this deal. Save a pretty penny when buying the Scholl Revlon Superdrug Exclusive Pedi and Nail Polish Pack, which was £44.99, but now yours for only £22.48 thanks to the Black Friday sale. 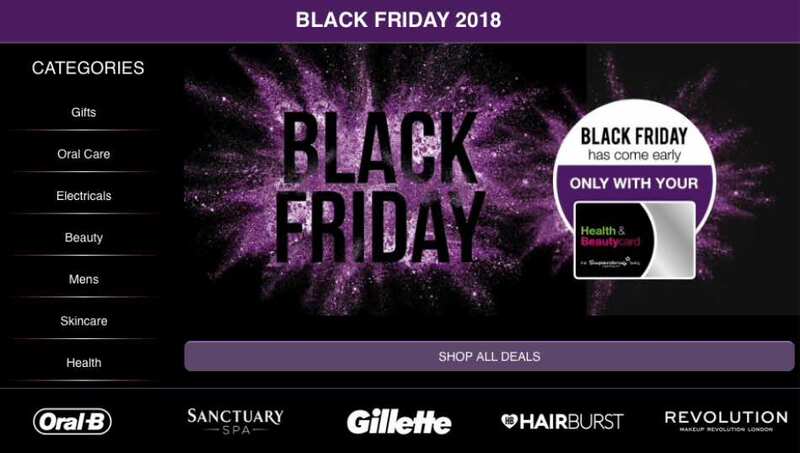 The Superdrug Black Friday deals for ALL customers will run from 23rd November until the 29th. The Superdrug Black Friday deals were for members early for the last few days, but now all customers can bag a bargain. Superdrug has amazing deals for member, and not so bad for non members. There are 269 products up for grabs. The Elizabeth Arden 8 Hour Set for Superdrug members can buy this early Black Friday deal for only £20 reduced from £60. Deal applied at the checkout. Many products are like better than half price such as Makeup Revolution 12 Days of Christmas Storage Chest for £25 reduced from £50. If you are NOT a member then it will cst you £35, which is still cheap. And the Superdrug Black Friday deals are on! Customers are going to really love this one. Only got 3 days and 10 hours left until Monday and then we can get to grips with the deals about to come our way. I could do with a few perfume gift sets. The Superdrug Black Friday countdown clock is ticking with only 12 days to go. It says the deals will begin on November 21st with exclusive member deals, and then for all customers from the 23rd until the 29th. I just saved half the price and got double points on my recent purchase, which was the BaByliss Ombre Hairdryer the price is now only £22.49, and under the product you will see the Save up to 1/2 price on selected Babyliss Beautycard Points: 22 . I have seen online the Real Techniques Ultimate Gift Set for only £48.99 reduced from £99.99, which is a huge saving of £51. I so hope they are doing this in store tomorrow as i am going past a store and could pick up right away rather than ordering online. This is great news, it is a shame the stores will not be opening slightly earlier but still good they are taking part in store. Cheers guys for the heads up. I just bought the BaByliss 3Q Hairdryer and saved my self £29.99, i paid £90 instead of £119.99. I am now tempted in buying the Real Techniques Ultimate Gift Set because this has a huge £51 discount. I just saved £5 on the Ghost Deep Night 50ml Edt Mega Set, only cost me £30. If lasts year Superdrug Black Friday was called ‘Pink Friday’ where they had up to 50% off many products, what will they be calling it this year, and will they give the same percentage off this year? Is the Superdrug Black Friday UK deals going to last a whole week or just the BF weekend rolling into Cyber Monday? Get £3 off the 1D Complete Palette Collection Louis, which is normally £10. It is now only £7. When will the Black Friday ad show up for Superdrug?